A simple plan to keep your diamond jewelry looking beautiful is to soak it in a gentle degreasing solution, such as water with a few drops of mild dish soap, once or twice a week. After you remove the diamond from the cleaning solution, use a soft, clean toothbrush to remove any remaining dirt. The toothbrush should be new and reserved exclusively for cleaning your jewelry. Use it to clean hard-to-reach places like the back of the diamond, which tends to collect the most oil and dirt. 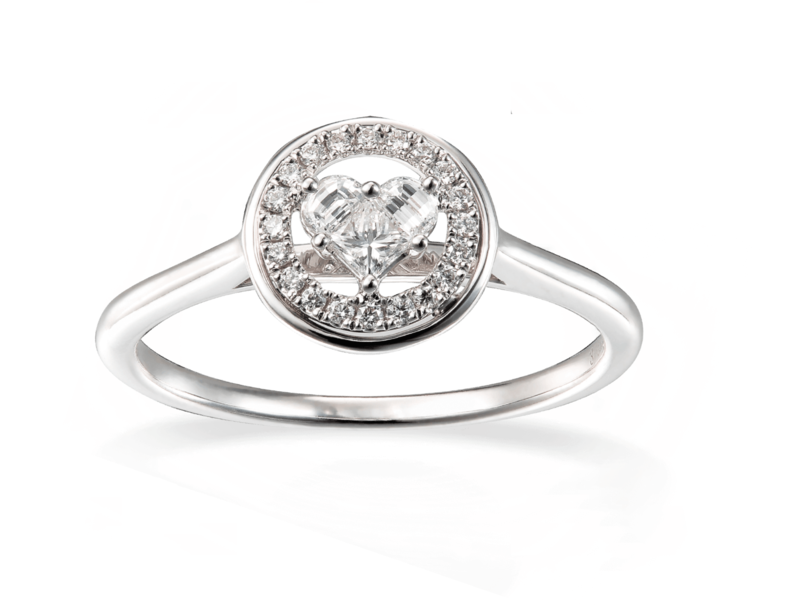 The 4 C's:Cut - Describes the finish, proportion and polish of the diamond. These factors determine the fire and brilliance of a diamond.An Ideal Cut diamond is a round (also known as brilliant) or princess cut diamond that is cut to ideal proportions and angles and has excellent polish and symmetry ratings.A True Hearts diamond is a round or princess cut diamond that exhibits a near flawless Hearts and Arrows pattern of perfect optical symmetry, maximizing the diamond’s fire, brilliance and light dispersion.Clarity - Describes the clearness or purity of a diamond. A grade is assigned to each diamond, with "F" representing a flawless diamond to "I" describing a diamond that has inclusions. Most diamonds can be found at various grades between “F” and “I.” Diamond buyers will sometimes choose a gem with some inclusions, as long as they are not visible to the naked eye.Color - From white to yellow, diamonds receive a grade for the amount of color they contain. Diamond buyers prefer colorless to near colorless diamonds, with diamonds graded J, K, and L offering the best value for a customer’s money.Carat - Carat refers to the weight of the diamond. One carat is equivalent to 0.20 grams. The larger the carat, the pricier the diamond, although the other "C's" can influence the final price significantly. Platinum is a naturally lustrous silvery white, and because of its beauty and hypoallergenic status is a sought after metal for jewelry. Platinum requires very little maintenance, as it is corrosion resistant and does not tarnish. It is also less malleable than gold.18K white gold has a similar silvery white appearance to platinum, making it another stunning choice for jewelry. It is generally not suggested for those with a nickel allergy. Because it features rhodium plating, white gold must be re-plated with some regularity to maintain its color.Rose gold is a lovely alloy of gold and copper, with a lustrous blush-pink tone. The copper in the alloy lends strength to 14K rose gold, so it is a durable choice which does not require extra maintenance.18K yellow gold boasts the rich hue for which gold is famous, and its luster is beautiful. 18K yellow gold is 75% fine gold and 25% alloys added to strengthen the metal, making it suitably durable for everyday wear.